The study of any philosophy is doomed eventually to the solipsism of the idea as the real world falls away and is replaced by the construct of the world. When Buckley favored being governed by the first 2,000 people in the Manhattan phone book than the faculty at Harvard, he was on solid ground. The first 2,000 people in the phone book, good or bad, are more likely to live in the real world than in some strange construct of the real world. And that experience will endow them with some sense of how things actually work. Some of the faculty of Harvard may live in Manhattan, but it is an imaginary Manhattan whose social and economic laws differ drastically from those of the world. Academics are good at theory, not just the theory of riding a bicycle as opposed to the physical act of riding one, but of inhabiting a universe entirely based on that theory. An academic can create a theory in which bicycles cannot be ridden or in which cars have no mass and exist indefinitely in that world. If his theory is trendy enough, if he recruits enough students who become faculty who recruit more students into his peculiar world, the theory will spill over into the real world and begin to affect it. Some insane obsessions that can exist only in academia stay there. The taxpayers finance them, but they rarely have to hear about them except when a tabloid looking for a few inches of column outrage reveals how many millions are being spent on studies on why lesbians drink too much or a professor who has spent his entire career writing papers on the gay subtext of Sears catalogs from the 1950s. Others don't stay there. Our modern obsession with racial subtext is largely the work of academics. Sociology has done more damage to American society than crack cocaine, economists who make a living telling government officials that money can be printed infinitely are a political disease and anything to do with the climate has been so thoroughly contaminated with bad motives and bad science that it might as well involve JFK assassination or moon landing conspiracy theories. Americans got used to the idea that academia was an eccentric place full of wacky professors who occasionally came up with brilliant ideas. This was a convenient myth to cultivate because it obscured the more problematic fact that outside the sciences, the professors were rarely brilliant and their eccentricity wasn't an individual habit, but a collective political reality distortion field. Even setting aside the influence of the left, the fields that were meant to serve as storehouses of knowledge and learning instead became wonderlands of strange theories that came to life and took them over until the fields no longer studied anything real, but only found ways to sort facts from the real world into their theory world. American Studies, now on the receiving end of a good deal of unexpected attention after its clumsy boycott of Israel, has very little to do with studying America and a great deal to do with academics studying a world made out of their own theories that has as much in common with America as Wonderland had with Dodgson's Oxford. Academia has become an alternate world where human relations exist in a mechanical universe governed entirely by identity politics, where the world is always on the verge of a Green Apocalypse and the only way to make anything work is to route it through the foundational theories of existence. This magical world continually changes in response to new theories bubbling up from trendy publications. The very laws of the universe can be gendered and every historical event can be rewritten by viewing it through the lens of class. Academia is a magical world where nothing is truly fixed and everything exists on belief. Change the belief and you change the reality. It's a meta-world that has a certain fanciful appeal for intellectuals, but little relevance to the real world where things do not change because the theory does and where outcomes are hard and real and the consequences of a bad theory can mean lives lost. The behavior of literary characters can allow for endless perspectives, because they are both human and unreal. Economics however cannot be as infinitely elastic. Nor can any more practical field. And the infinite elasticity of literary reinterpretations is destructive because it turns the interpretation into the center of the story. The work becomes secondary and the perspective becomes primary. The words of Twelfth Night fall away and are replaced by an academic's clever perspective on it instead. But it seems churlish to complain about something as wholesome as that when Twelfth Night, Shakespeare, English literature, the Western Canon and the written word have long ago ceased to exist as anything other than footnotes and references in a paper on not merely gender, class or race, but some perspective on a theory on all three. 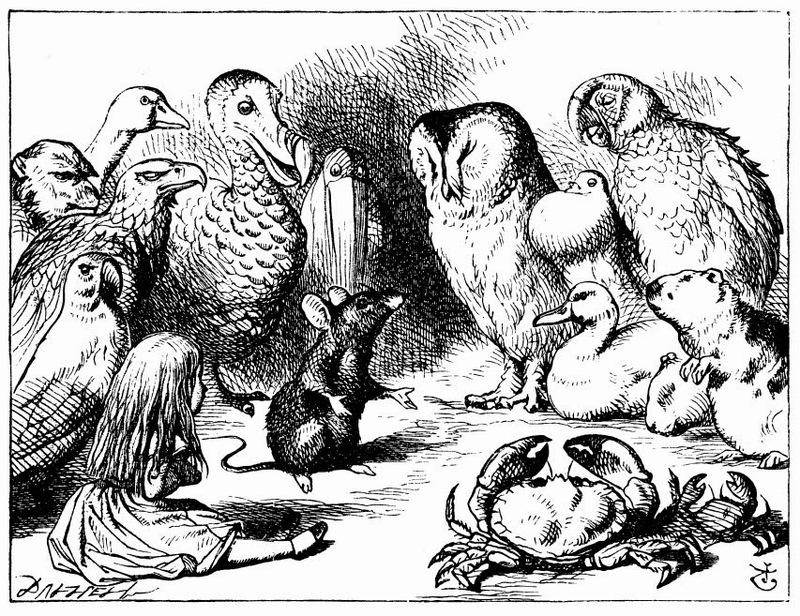 It's Alice in Wonderland's rabbit hole and the only thing on the other end is more of the same. 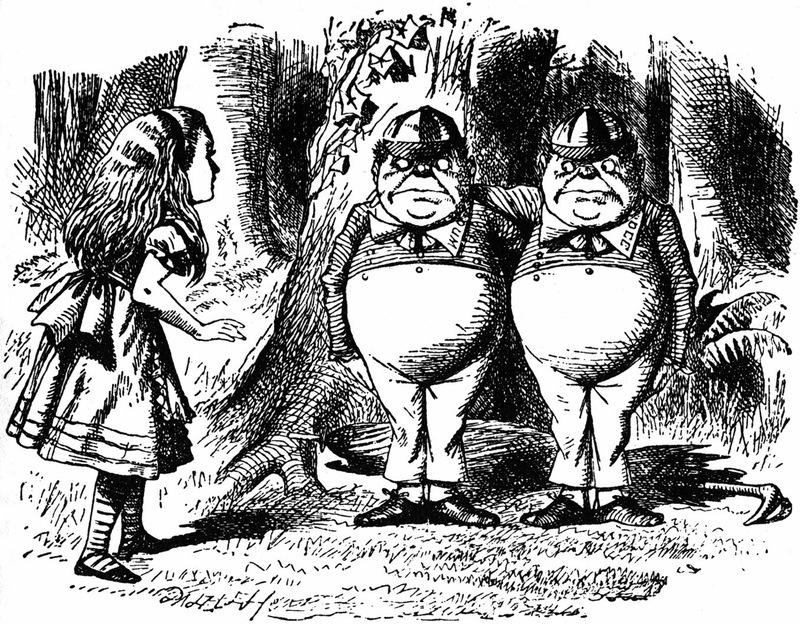 It's Academics in Wonderland all the way down. Academia is dedicated to its own theories. The real world is a reference point in an unreal world the way that an inhabitant of Plato's cave might point at the shape of a shadow as evidence in a ghost story that he is busy telling. And it might be fitting to leave the lunatics in this very expensive asylum if academia had not long ago begun calling the shots in the real world. Every society needs ideas and those ideas rarely come from politicians, generals and CEOs. The men at the top are good at getting to the top. They're usually not as good at coming up with things to do once they're there except listen to their favorite experts who are usually leaders in the field of being experts who have their own experts whom they listen to and so on, like Swift's fleas, ad infinitum. There's a reason that Obama has recycled many of the policies of the Clinton and Bush administrations. It's because unless a little fairy from the Center for American Progress whispers a policy proposal into his teleprompter, he has no idea what to do next except take another vacation. The Center for American Progress fairy gets its ideas from a bunch of reprocessed papers that culminated in a book whose bad ideas were simmering in academia for decades beforehand. Thus the lunatic idea from a paper that is written entirely in unreadable Marxist gibberish and dismissed as irrelevant by any sane person is dressed up, popularized and taken around town by people who know how to translate its specialized language into something readable by the sort of people who will then turn it into dishonest slogans and market the whole thing as sound common sense that we ought to adopt right now to invest in our future and save our children. What we have developed is a production process that takes the gibberings of a lunatic hermit in a cave and slowly translates them by a series of interpreters into convincing speech that capture the consciences of kings. The process is part Marxism-Leninism and part Madison Avenue and as a result of it we have a country that runs as well as any university-- that is badly, in debt and delusional. The insane are leading the blind off a cliff that the blind can't see and that the insane insist isn't there. Our ideas of how society ought to run come from people who live in an imaginary world, but who are at the center of systems that make their ideas seem sensible and workable with tricks of propaganda. The United States of America would not only do better being governed by the first 2,000 names in the Manhattan phone book, all of whom happen to be Adams, but by people who believe that we are being abducted by space aliens or that the pyramids were spaceships so long as they were able to confine their eccentricity to that one area, and dwell otherwise in a real world of hard realities. Academia tells us how everything ought to be, based on their foundational theories, with little regard for how the world is. Incompatible results, whether in climate science or social sciences, are buried and suppressed, ridiculed away or blamed on the big business boogeyman or Ronald Reagan. There is no honest attempt to engage with any of the disasters left behind or any of those coming up ahead. And that's the attitude for fields where there are actually results. These are the exceptions, not the rules. Much of what passes for academia now no longer has results or any external context. There is an internal structure of ideas and rules with little relation to the outside world. There are no results to be had from running everything through the broken photocopier of race, class and gender, not only because it's a childish waste of time, but because it's not the thing itself that is of interest but the lens. Academia has become a world of lenses, a vast optometrist's office with no patients, a telescope that sees the flaws in its lens when it thinks that it's looking at Martian canals and builds up an entire tale of a dying Martian race on a planet that is running out of water and then, even when the probes have shown that the canals do not exist, moves that tale over to earth and warns that global warming will turn Earth into another Mars or Venus and builds an entire theory based on an imaginary catastrophe. The lens everywhere has become more important than the thing being looked at. Things are knowable facts and so not very interesting. A rock will eventually prove to be a rock. A word will have a meaning. But a theory, a lens, a perspective is an eternal joy because it can be reconfigured and played with endlessly, like magic it can be waved over everything to transform the real world into an academic wonderland where nothing has substance and everything can change on a whim. Academia has become the endless voyage into an imaginary world with no thought of destination. "Academics are good at theory, not just the theory of riding a bicycle as opposed to the physical act of riding one, but of inhabiting a universe entirely based on that theory." They are good at hard scientific theory but poor at social scientific theory that is usually loaded with endlessly recycled politically correct jargon. "And the beat goes on." The worker drones in the media are always at a loss when the round peg does not fit in the square hole. Sad, damn sad! As a young man I wandered into a mystical period of life. You know, the more one knows, the less one knows. Every facet exposes another 100 facets. One cannot make a decision on any subject because there is always more information. Then, I was drafted into the Army. Gee 4 am was real. A 10 mile run was, in fact 10 miles. Then onto the corporate world. A sales decrease of 5% was real. It would get you fired. Started my own very small company. We build things. If things aren't attractive to the eye, functional, and fairly priced, bankruptcy may follow. It is , of course, impossible to explain away a poorly performing, overpriced product by informing people what they see is not what I see. Just presenting one man's narrow view. I understand there used to be a saying in the Royal Navy--"today's wardroom roast beef is tomorrow's lower-deck stew"..meaning, I believe that what is being discussed today among to officers will be talked about tomorrow, probably in rather confused form, by the enlisted sailors." That basically explains the relationship between today's academia and the rest of the society. The transmission path is: from Academia to the "respectable" Print Media..thence to the General Media...thence to the Entertainment Media...from each of these stages there is a transmission path to broadening segments of the overall population. "Sociology has done more damage to American society than crack cocaine"
So true. Crack cocaine wrecks individuals or a neighborhood but sociologists destroy the whole society with their smug, self-righteous meddling. Sometime in the last couple decades it's become imperative that everyone must go to college. Not only must everyone go for the sake of their parents bragging rights but also because almost every job requires it. Up here in Canada , I'm sure the local dog catcher position requires a degree now and also you need to be bilingual. There was an implication in what you wrote that the problem you describe so well was perhaps not relevant to the hard sciences. In fact, with very few exceptions, I believe the problems you described are even worse in the the sciences because that is where the real money goes. Self-appointed cliques (who dominate niche areas by controlling journals and grant reviews and perpetuate it with an endless stream of PhD students) can create massively financed empires on the basis of irrelevant (and sometimes fraudulent) ideas. "The process is part Marxist-Leninism and part Madison Avenue and as a result of it we have a country that runs as well as any university-- that is badly, in debt and delusional." That one sentence sums things up nicely. Madison Avenue's techniques and advertisements that convince us to buy products we don't need, don't want, and can't afford have been adopted by the political class to sell us insanity, cultural suicide and economic ruin as products that we do want, do need, and must pay their high price even though we don't want to and can't afford to. Ayn Rand called the academic's manner of thinking The Primacy of Consciousness which means that the mind creates what exists in the world. The philosopher who succeeded in embedding this theory in academia is of course Immanuel Kant. Your excellent essay is actually about The Primacy of Consciousness vs The Primacy of Existence. "Americans got used to the idea that academia was an eccentric place full of wacky professors who occasionally came up with brilliant ideas." This is the anti-intellectual bane of the country. Liberal intellectuals are the cause with their semi-Utopian plans for "transforming" the country It was a raving liberal, Adlai E. Stevenson, who inspired the coining of the term, "egghead," and lost his bid for the presidency because of it. Americans despise eggheads. But America needs ideas, just as the Founders needed ideas. The ideas they adopted were inexorably linked to the real world. The ideas current today float in the air and have nothing to do with reality. They are promulgated by sumptuously paid eggheads in and out of academia. As one who began teaching at the college level after retiring from law enforcement, it is astounding to see the mentality that exists on a college campus at least within the humanities and social sciences. I will say, however that since I teach English as a Second Language, which only requires a masters degree, you do get a better mix of people who have lived in other parts of the world, speak other languages, and in many cases, are married to spouses of different nationalities. The ones I work with also have a wider range of political ideas. In addition, UC Irvine, where I teach, has a smaller humanities department while most of the focus is on engineering, pre-med, biology and hard sciences. That makes a big difference, both in faculty and students. Having said that, I agree with Daniel. In my case, I was fortunate. I got my masters at age 48 only because my government agency funded it since I was in a training position shortly before I retired. I stopped there. Had I been younger, in a different profession (or none at all), and gotten a PhD, I would likely have been educated out of the last ounce of common sense I was born with. This piece is such a beautiful intellectual tour de force that one almost -- not quite, but almost -- wants to admire it for itself alone. But the ideas you express are important. Thank you for a work of both beauty and utility. Cultural Marxism has indeed seeped into the hard sciences. - 1)Common Core's emphasis on "word problems" in elementary school math gives room for Marxist concepts to enter even math. The vagueness of common core standards makes it unsafe for teachers to develop their own word problems, so they must use the Marxist word problems furnished by common core. 2) Climate change scientists openly fudge the records - eliminating the "medieval warm period" from the data in order to obtain their desired "hockey stick" graphs; moving thermometers from rural areas to hotter cities; scheming to prevent climate-realists from publishing or advancing within the universities. And all because climate change is a tool for Marxist re-distribution. 3) The New Yorker magazine ran an article about the sharp increase in non-replicable scientific experiments. New theories come out, experiments verifying these theories are published in respected journals, further new theories are built on these original theories - and then in turns out that no one who repeats the experiment gets the same result as the original theorist! Corruption in academe on an unprecedented scale. The same universities who are horrified by the possibility of being corrupted by corporate money seem oblivious to the possibility of corruption by government money or Soros money. Loved it all until the end. That there is no sought destination. Not everyone pushing what is being touted as the Great Transition and the three pillars of sustainability and transdisciplinary problem-solving studies may know the destination, but it's no secret either. It is laid out most recently and alarmingly in Management Education for the World. http://www.invisibleserfscollar.com/finale-of-the-dangerous-mindset-trilogy-spreading-the-contagion-to-fundamentally-alter-how-we-think-and-live/ explains what is being pushed globally. It is nonsense and it won't work and pushing this gets you tenure and NSF grants and think-tank work giving speeches at Brookings about Metropolitanism. Notice how this goal wants professors to become more involved in business so they can remake its purpose and the nature of the economy. It's nuts, but it's influential nevertheless. All, those "internal structures of ideas and rules" divorced from reality. That also explains the folly of those who seek to understand and explain strategy and all of real life in terms of an NFL football game or chess. Arbitrary rules and formulas don't apply out of context. Also why novels and movies never are good guides for illustrating and explaining the vagaries of unscripted reality. A superb description of academias' subjectivism, but I suspect the author is underestimating the malevalence of their motives: hatred of the good because it's good; essentially, the wish for destruction for the sake of destruction, which is what selflessness degenerates into, as Ayn Rand demonstrated. They aren't innocent, misguided children playing with toys. Academia is our shadow government - funded, providing the experts and bureaucrats, and ultimately calling the shorts. Hence we have Bernanke followed by Yellen, who is literally a socialist from LSE, in control of tens of trillions of dollars despite never having worked for an actual bank. Hence a "Constitutional law professor" as president who doesn't acknowledge, or even mention in passing, the Constitution. Hence the politicization of our military academies, who now teach the same garbage race, gender, and class studies as our so-called Ivy Leagues. And, on top of all that, it's impossible to fail out of Harvard! Is it any surprise that a study of dissertations estimated a plagiarism rate of 30%? Do not give them donations for any reason. Do not follow college sports. Do not send your children to prestigious schools. Tell them all to go to hell. I was once snobbish about my alma mater. Now I despise it. You hit the nail on the head. Universities that hire these kinds of indoctrinators do not deserve our money. As always, remove government interference and the problem disappears in a generational puff of smoke. Remove guaranteed student loans or bailouts for big banks when it goes sour and the diploma-mills can no longer churn out useless degrees while charging big bucks. No more industry bodies like the AMA calling the shots and drafting legislation to control entire sectors of the economy (typically demanding everyone go through academia before they can get a job and thereby ensuring the next generation is compliant with their system of power). All of academia would have to self fund through producing something of value to society. Imagine the shift in paradigm. Imagine not needing a degree to teach kids to read and write. Imagine being able to discover new and useful cures for ailments without being tossed in jail for "impersonating a doctor". Imagine not needing a degree to get "proscription" medicine when you already know what you need and why. Slash your government down to a stub or just get rid of it all together. The problems all disappear. "There are a great many wise men in the world, but I have discovered that ordinary men are always called upon when any particular service is needed." Too many readers believe the literary work must relate to themselves, when it is their responsibility to relate to the work. Understand the author, don't interpret him. Such understanding comprises a reach into the external world. The records of ideas, are not the ideas they record. Often, it takes a lifetime for the individual to expand their understanding for their subjective to line up with the objective. The vast inability of the human mind to be able to determine appearance from essence should be a clue to awaken our Soul to the leadership position. In David R. Hawkins book "Reality, Spirituality and Modern Man" and Rupert Spira's "The Transparency of Things" one begins to gain an insight into how little we can ever know, and how immense the things we need to become.